I have never been ashamed to craft. Back in my University days I would happily sit with a needlepoint tapestry on the long (and I mean long) train journey between home and my college town. Very rock and roll. In the last decade I have become a braver ‘alfresco’ knitter. A train journey is perhaps my favourite ‘out’ experience. I sense people staring at me. Gone are the days when I look ‘too young to knit’ but I think the speed of the hands is quite mesmeric for the onlooker. For fun I will quickly look up and stare my observer in the face. Embarrassed they will often look away, but mostly they smile and ask me what I’m making. If you are in a group of ‘tricoteuse’ then you can feel very brave. 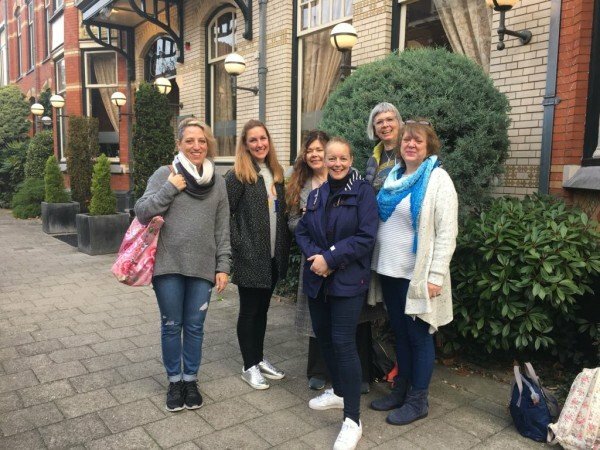 In the Autumn I was very lucky to join some of my Stylecraft Blogstars on a trip to Breidagen yarn festival in the Netherlands. We had a wonderful time, talking and teaching with yarn enthusiasts from across Europe. Hilariously at dinner, either in the hotel or a restaurant our bottoms barely hit the seat before the project bags were open and our hands worked the yarn. There is definitely security in numbers, but in these circumstances it would almost seem rude not to. In these moments, chatting away we shared our love of the craft. We quickly passed on our hints and tips like a supers-speedy masterclass. 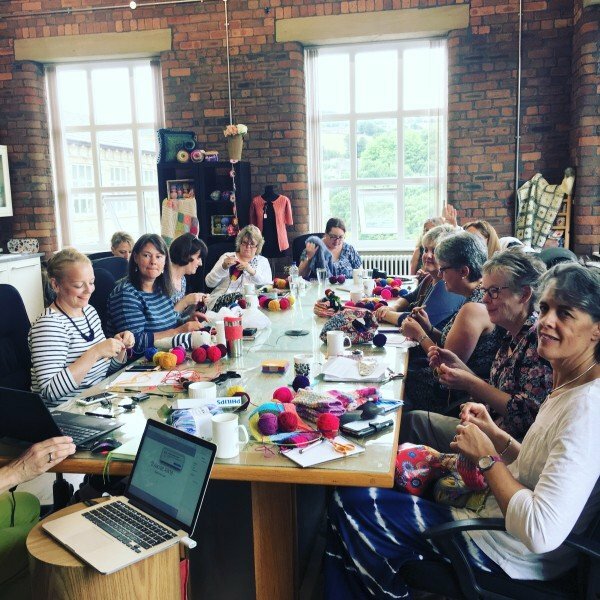 (The photo below is some of the Stylecaft Blogstars at Spa Mill – the gorgeous Phil Saul of Twisted Yarn took the image). 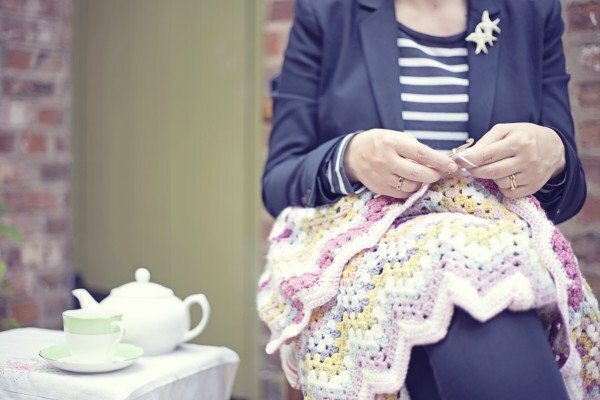 Anyone who attends a regular knit and knatter group will tell you how much they love to craft in community. The activity is as old as the hills and is so important for the future of our craft. There are still places and instances where I don’t knit or crochet. A special birthday, a posh restaurant, a wedding or funeral. In these very busy days I very rarely knit at work. I don’t have time to take the needles out at lunchtime. However, in the last year I have expanded my extreme knitting venues. Learning to knit socks has enabled me to knit in the cinema. This is particularly useful if the film is not quite my taste – a film my son would like me to enjoy with him, but wouldn’t normally be my first choice…basically Star Wars. 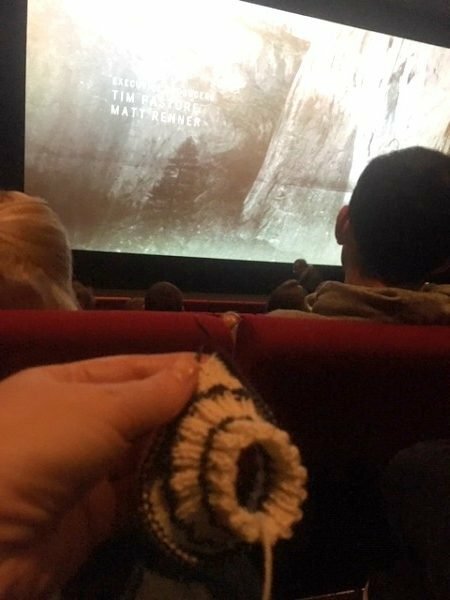 Knitting in the cinemas is also helpful for really tense films. Over Christmas we went to see the climbing movie, Free Solo. Oh my word. As the action got more tense my stitching got faster and faster. You might wonder in the dark, how is this possible? With a small circular needle and a basic stitch my fingers know exactly where to go. I can feel where the next stitch is and instinctively I even know if I have gone wrong. How bizarre. But this is just knitting. Even though I am ambi-tectrous (can knit and crochet) I still need to be able to see where I put the hook in for crochet. When I crochet, I am a much faster and proficient, but a little less instinctive. I love the fact that I see more and more people sewing, knitting and crocheting in public spaces. Perhaps it is due to the growing numbers of people taking up a craft. In fact as I try to stay off my phone, knitting or crochet seem more appealing. I just must remember to look up more. – Then tell Wind and Fire where to stop, but don’t tell me. 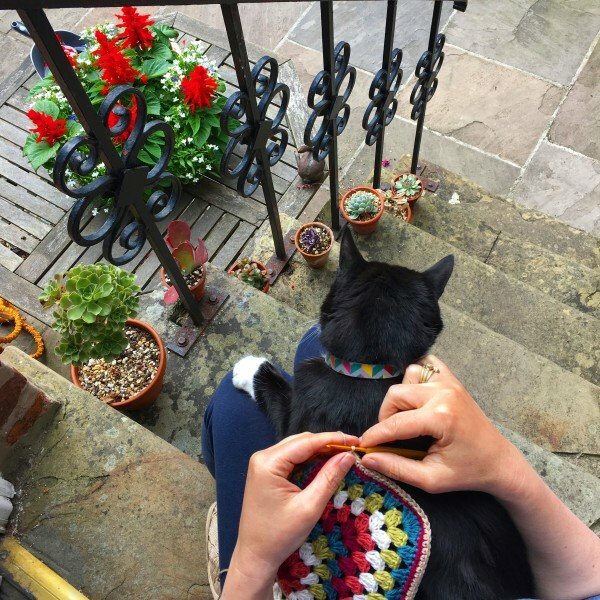 Where will you knit or crochet – where will you not? In 2018 I crocheted from England to Iceland and back, much the the fascination of other passengers. I crochet on trains, buses in the car, pretty much anywhere I can sit down. To the point where if my main project is a bit big, I’ll have something smaller that I can carry round with me on the go as well, like squares or a scarf. I crochet granny suares in the dr.’s office, or dentists’s, & have for many years. I keep these grannies to go & work on full-size afghans at home. I love the topic of this post, Emma. Like you, time is precious so I will crochet whenever I can. Those few minutes here and there soon add up and it is a good stress reliever. As for people staring, I know how tiresome it can be – I use a wheelchair and by the way some people stare, you would think they had never seen one before. The rudest thing is when people stare and then turn away when you go to look straight at them. It is a bit of a game, isn’t it? I’m glad I am not the only one who likes to stir the pot sometimes for a bit of fun. I’ve got a little bit cheekier nowadays and if they keep on with that rude behaviour for too long, I will politely call them out by addressing them, especially if there are plenty of other people around. Either they are so embarrassed that they disappear quickly or I make a new acquaintance and diffuse the tension. People are funny sometimes but I want them to think about their behaviour. Sometimes you need to touch them emotionally to make them realise. Good for you for knitting wherever you like. Keep up the good work! I am never without socks on the needles, I knit whenever I am waiting. I was knitting in a fabric shop yesterday as they were rushed off their feet. I ended up giving an impromptu lesson in magic loop and turning a heel. 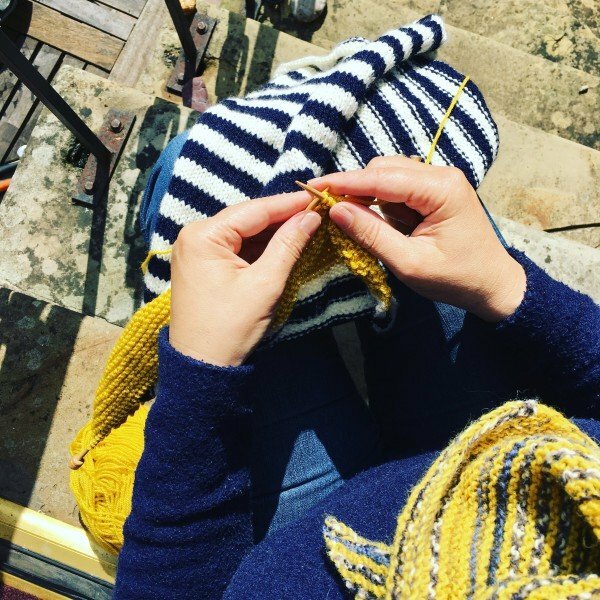 I’ve never knit in public before – might just give it a try! I take my knitting with me almost everywhere. For travel purposes it’s almost always a sock-knitting project. Once I find a make and variety of circular needle that actually works (no nasty cable/needle joins to catch the stitches) I’ll even be rid of my bamboo dpn’s tendencies to make the odd bid for freedom. I’ve lost one down a ventilation grille that way! I take my hook and a stash of wool wherever I go! I have huge blankets I’m working on that stay at home but I take my baby blankets, scarves, granny squares with me. I’ve learnt to deal with the stares, but people have learnt that just because I’ve got my head down, doesn’t mean I’m not paying attention!